Extended highlights of the 1998 World Cup Final is currently on repeat on a particular British television channel showing ‘classic’ sporting encounters. Most famous for Zidane’s two headers and Ronaldo’s pre-match breakdown, it’s not a game that is generally held up as a great tactical victory. And it probably wasn’t. If Brazil had marked at set-pieces better, the result might have been different – the sides had a similar number of chances in open play. There were three things noticeable about the France side, however, which is normally looked upon as being a 4-3-2-1, with Zinedine Zidane and Youri Djorkaeff playing just behind Stephane Guivarc’h. Firstly, Guivarc’h’s role was a lot different to how it is remembered. With Fabio Capello opting for Emile Heskey upfront throughout England’s recent qualifiers, the inevitable anti-Heskey feeling emerged amongst people who believe that you need a goalscorer upfront. And those who believe Heskey is important for England rightfully point to the fact that France won the World Cup by playing Guivarc’h as their main striker, who didn’t score for the entire tournament. Guivarc’h, apparently, brought the best out of the team. But actually, it’s difficult to see quite what he did for France. He didn’t hold the ball up, his movement wasn’t particularly good, he didn’t win aerial encounters and he didn’t defend from the front. None of France’s best moves came from Guivarc’h doing anything well. France were simply a good side with a really poor striker, and he simply missed a hatful of chances. Secondly, the system was a lot more 4-3-1-2 than it was 4-3-2-1. Djorkaeff plays almost in a conventional striker role when France have the ball – he drops deeper to occupy either Dunga or Cesar Sampaio when Brazil are on the attack, but he plays much closer to Guivarc’h than he does to Zidane. Thirdly, the French defenders have an unbelievable license to attack. With Deschamps sitting in front of the defence, Petit covering the left-hand side and Karembeu the right, the back four regularly motor forward to join the attack. Lizarazu, of course, made a career out of this throughout his career, and Thuram motored forward in the semi-final to score the only goals of his international career. But even the centre-backs drive forward. Marcel Desailly brought the ball out of defence like a sweeper – and it was on one of his charges forward that he received his second yellow card for a foul on Cafu, and was sent-off. France adjusted by shifting Emmanuel Petit into the backline, and yet Petit still felt free to run forward in stoppage time to grab a third goal for the France. So the two most significant moments of the second half came from the furthest forward French player being one of their centre-backs. This is admittedly only from watching hour-long highlights of the one gae, but it was interesting how different France actually set up, compared to how they are often remembered. Actually, Guivarc’h had one function that may be overlooked on your post. He was a physical player who tried to create spaces for Djorkaeff’s runs and also kept the centre-backs so busy that they would tire and couldn’t deal with Henry when he would come from the bench. The matches when it didn’t work were the ones against Paraguay and Italy. Paraguay had a team built around a sturdy and effective defence with Ayala, Gamarra (the outstanding defender of the tournament) and Chilavert. Italy had Cannavaro and Nesta who didn’t play physically and their pace was more than enough to allow them to leave Guivarc’h free and then recover if he got the ball. I understand that was the purpose of him, but did he actually perform the role well? All of France’s goals in the knockout stages came from either set-pieces or from defenders surging forward. Guivarc’h didn’t really seem to be that effective at all. The perception at the time was that he had a bad tournament, but the revisionist attitude was that he was crucial to the way France played. I just wonder whether, in fact, the initial view was correct. 1998 was the only World Cup I personally attended in the flesh and was fortunate enough to see France-Italy and Croatia-Germany in the quarter-finals, France against Croatia in the semi-final and then the bronze match (but that hardly counts as I was stuck behind a corner flag and hardly saw a thing). What was amazing to see at the stadium that you didn’t see on TV was how incredibly well drilled the France team was. The slightest movement from one player shifted the entire team, it was magnificent to watch how well each player knew how to react and where he had to be. 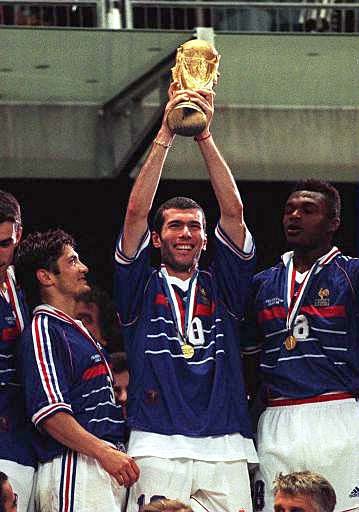 I’m not sure they ever got enough credit for that, most people just looking at Zidane. That’s true. He was picked up only because he was the best striker of the league in 96-97 and 97-98 with 22 and 21 goals. He made it 4 times to the starting XI 4 times but was substituted each time and came in as a sub twice. Henry and Trezeguet were too young. I think france won the world due to a combination of outstanding midfield and defence + the lackluster display by Brazil in the final of the world cup.